- I was excited to fins out the Arizona's highest peak was just eleven miles north of where I was staying in Flagstaff Arizona. In fact, you could see the peak from my hotel. There was still some snow scattered around the mountain but it was obvious that it was sparse enough that it would be no issue for me to hike it without traction. - The trailhead is located at What is called the 'Snowbowl' where there is a ski area. The trail cuts across the ski area then heads into the woods and uphill over, you guessed it, switchbacks, man they love switchbacks out here! - I took my time hiking up to the ridgeline, mostly because I was sore from the day before in the Grand Canyon. The trail footing reminded me of the White Mountains, roots and rocks but it was never steep at all thanks to those switchbacks. Once gaining the ridge and popping into the alpine tundra the wind was whipping around 20 plus mph and the terrain changed to more or less what you'd find just below the summit cone of Mount Jefferson on the Castle Trail. The only difference is it's not a continuous rock hop and the rocks are black not grey. 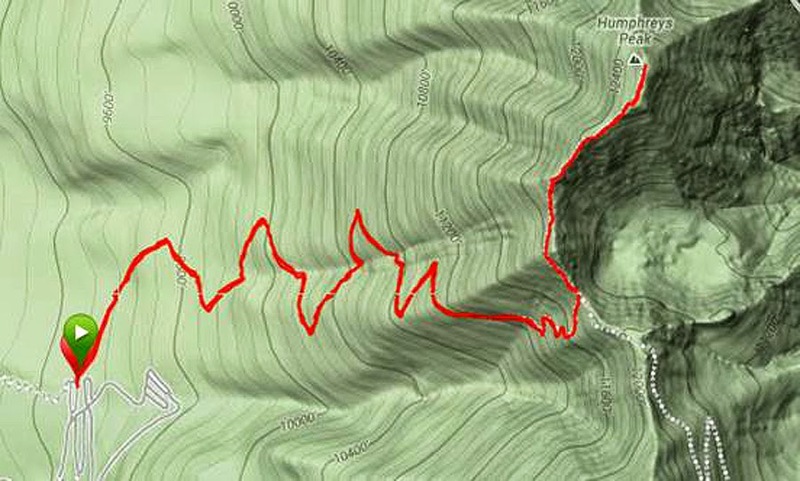 - The trail travels along the exposed ridgeline for almost a mile and a half before reaching the summit. The summit has a rock foundation and a tall summit sign on it. - Views from the top were spectacular, the surrounding mountains were black with patches of snow in the ravines and valley's. The only bummer was it was a little hazy out so I couldn't see the Grand Canyon to the north. Still, it was a pretty cool place to catch some views. The summit was somehow less windy than the ridge leading up to it so I basked in the sun for a half hour before heading back down to the car. Big view from the summit!